Over the next month give or take, Grace Lightbourne, the Angel-in-Training main character from my new novel Winging It!, will interview quite a few authors on this blog. It’s been incredible to get to know some of these writers a little better, and I hope you’ll stop by every day or every couple days or every week to get to know them too. Today, Dalya Moon has stopped by for the very first interview by Grace, which should let you know what a brave soul she really is! Dalya’s novel Poke is the story of Zan, a teenage boy with a talent for discovering any girl’s secrets. If he asks a girl to poke her finger into his navel, he gets a psychic trip to Secret Town. Zan never likes what he finds.When he meets mysterious, beautiful Austin, with her waist-length hair and mature laugh, he wants to get acquainted with her the slow way. Austin, however, can’t resist her curiosity, and when she pokes her finger into Zan’s belly button, he sees … nothing. Austin dashes out of Zan’s house and out of his life, leaving Zan heartbroken and confused. To find peace, he must unravel the secret of his power. Is it a gift, or a curse? How can Zan love someone with no future? How can he not? 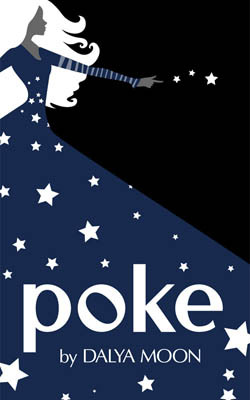 Poke is a fast-paced story about Zan’s adventurous summer, as he battles witches, experiments with astral projection, and discovers the secret of his strange power, all to be with the girl he loves. Everytime I read the description of this book or look at Dalya’s cover it makes me smile. How could anyone not be intrigued about witches, astral projection and navels? Let’s get to know Dalya…take it away, Grace. Hi, Dalya! Your Muse must be doing a great job inspiring you. What’s the next project they’re helping you out on? My Muse is a real task-master, so I’m working on three books simultaneously. Three? Seriously? One seems like it would be an awful lot of work, and I tend to, um…avoid that. If at all possible. So, with three books you must have a lot of characters. Which one are you most like? If there were a boring character, perhaps a writer on a laptop in the background of a scene, that would be me. If she has curly hair, then it’s me for sure. On a deeper level, there’s a lot of me in every character, even the boys. My character in Poke, Zan, is sensitive like me. I know that’s not a traditionally “masculine” trait, but when I think about his background and his powers, and how that would affect a person, it seemed right. Boy, do I ever know how tough powers can be! So, will you tell me — what’s your favorite book of all time? No favorites? Awww, that makes me a little sad. Well, we’ll just skip ahead. In your opinion, what makes a guy character swoony-worthy? Smoldering eyes. Yes, definitely the smolder, preferably on every page. Trick question! Would the real rock-n-rollers be up there? Of course they’re there, silly. Heaven wouldn’t be any fun without rock music, right? Singing, dancing, et cetera–oh, that reminds me–confession time. What’s your biggest writing sin? Bragging. Oh, am I supposed to be all coy and say I’m a “perfectionist” and I spend too much time getting everything just right? Would you believe me if I did? My biggest sin is telling people when I’ve finished a marathon writing session of 5,000 words. I’m just excited, but it drives other writers crazy, and I really shouldn’t do it. By the way, I wrote 2,000 words yesterday. Oh, that’s great! My roommate Mercy is a super good student so I’m kinda used to that overachiever thing. So, if you can be disciplined like that, are you more of a rule follower? Or do you rebel? I’m a first-born child, so my inclination is to follow rules. However, they’re the rules I made up for myself, and include such diverse things as don’t go to bed angry, and don’t have candy for breakfast. Those are veeery interesting rules, which makes me curious, what — other than your Muse, of course — inspires you? I’m inspired by nature and beauty and the dark side of human nature. When I was a little kid, my favorite book was about a witch who made blueberry pancakes. Hmmm…I’m not completely sure, but blueberry pancakes seem almost like candy for breakfast, yes? And, how awesome that you love nature! Me too. So, what themes do you write about or what do you want readers to take from your books. I don’t consciously work in themes, but they do emerge. If I could help people, one at a time, to remember to floss, I’d be happy. Flossing is really important. Argle, bargle. *pulls string from mouth* Absolutely. Well last question Dalya…is there anything you’d like me to mention to your Guardian Angel? ‘Cause I totally have contacts. Thank you for opening my eyes at the right times, and for giving me a strong sense of dissatisfaction when I was not on my proper path. Aww. That’s very nice and, really, that’s what we’re supposed to do. I’ll be sure to pass it along and it was wonderful to meet you. Hey Everyone! You should follow Dalya’s don’t go to bed angry rule, because it’s a good one. And, you should also check out her books on Amazon. Thanks, Grace. Hope everyone will stop back by tomorrow for an interview with Emily Ann Ward. and one more housekeeping note. For the next two days 4/12 and 4/13 Winging It! is priced at 99 cents, so if you’d like to help Grace earn her wings (and save two bucks) click here. April 12, 2012. Tags: author interview, Charlie Woodchuck is a Minor Niner, Dalya Moon, Poke, Practice Cake, Shel Delisle, Swarm, Winging It!. author interviews. Excellent interview. Dalya has a tremendous imagination, and can churn out a novel before I finish a microwave dinner. I enjoyed this interview and thanks Dalya for the insight into such a creative mind. April 13, 2012 at 12:24 am. Permalink. She’s awesome and I really wish I had her speedy writer skills! April 13, 2012 at 1:42 pm. Permalink.